If you live in Florida, you probably already know from first-hand experience what I’m about to tell you. There are a lot of unusual fauna all across the subtropical region of Florida, and the most concentrated area in Florida for large, bizarre, crawly things is the Everglades. The Everglades are a marshy, swampy, low-lying wetlands region that extends, roughly, from Lake Okeechobee in central Florida down to the state’s southern shores. And it’s full of reptiles and amphibious things you might not like to see in your bathroom late at night. It’s a herpetologist’s dream as a site to study, but lately it’s been turning into a nightmare. That’s because, over the past couple of decades, a variety of non-native species have found a very welcoming paradise in the Everglades and the highly populated areas that abut the wetlands. These invasive species have origin stories that are somewhat unclear, but the threat posed by one of them is quite clear, indeed. The largest and most dangerous of the non-native species is the Burmese python. What’s it doing there? Seriously, what in the name of Noah’s ark is the Burmese python doing in the Everglades? It’s messing with the ecosystem, that’s what it’s doing. A massive snake, the Burmese python ranges in size from 12 to 18 feet long and is an incredibly powerful crushing and constricting machine. It has a huge appetite and will eat almost anything. And it’s thriving in the Florida Everglades. It generally consumes small wildlife and, according to experts quoted in a fascinating film, Exotic Invaders, it has decimated the native populations of small animals in the Everglades. 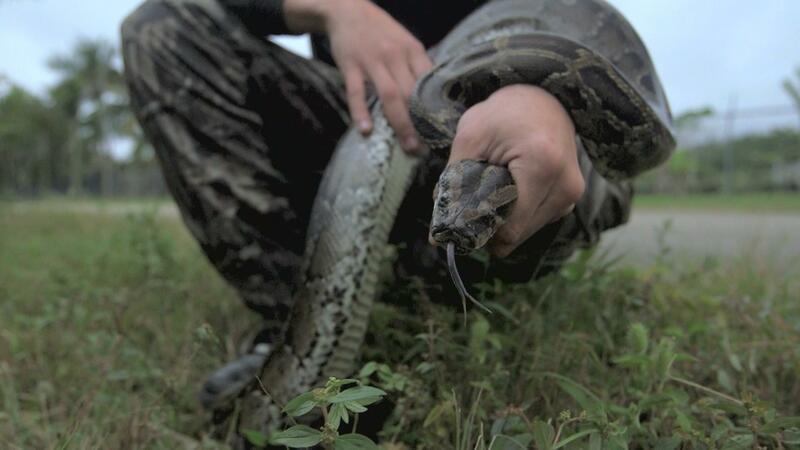 How did the Burmese python get to be such a threat to animals – and humans – so far from south and southeastern Asia? Was it introduction to Florida intentional, or a huge mistake? Did it happen slowly over many years, or was there some enormous accident? The answers are elusive, and no one is entirely sure how their numbers have become literally uncountable. There are just so many of them! How Did All Those Pythons Get into the Everglades? There are a variety of theories for how the pythons have reached a number and size that they actually threaten fierce creatures such as alligators in their natural habitat. Here are several explanations that are widely acknowledged to be probable. First, collectors of exotic creatures seem to be as common in south Florida as seagulls. They flock to the region’s humid, subtropical climate, which provides an ideal home for unusual animals from similar environments around the globe. So, it’s really no surprise that there are a lot of warm-weather fauna held privately in the state. These private collections, in the best of times, will “leak” captive animals into the wild by accident on a small scale. But Florida endures “worst of times” scenarios with alarming regularity. Hurricanes, tornadoes, and torrential rains of biblical proportions crisscross the peninsula all the time. And, not to be outdone by nature itself, Floridians seem to have a knack for creating their own problems, including rapid overdevelopment of irreplaceable wetlands and economic disasters such as the housing market debacle of 2007–2010 that forced many people from their homes (often leaving “pets” behind). Florida wildlife experts believe that numerous exotic animal breeding operations in the state may have been impacted by such shocks to the state’s system, causing large numbers of Burmese pythons and other exotic, invasive creatures to have been released – intentionally or not – into the wild. In response, believe it or not, the state of Florida officially (and strangely) recognized the status of Burmese pythons as a breeding population, making their removal even more problematic. How can these enormous snakes be effectively removed from the Everglades, without doing further damage to the already fragile ecosystem of south Florida and the Everglades? Well, it won’t be easy. The clear and most obvious method was adopted by the U.S. government, in 2012, when it made importation of Burmese pythons illegal. And the Florida state authorities introduced procedures to discourage dumping of invasive species into the wild by requiring owners of large snakes to have microchips implanted into their animals. But full-scale eradication? As a short-term goal, it’s just not likely to happen. Many proposals have been put forward, but the only method that has worked– even on a miniscule scale – is human intervention in the form of snake catchers, who all have stories to tell about the biggest snakes they’ve captured – and, of course, the ones that got away. No doubt, we have only our fellow humans to blame for the upheaval in Florida’s native ecosystem, and, with a lot of luck and perseverance, it could be that humans that will tip the system aright again. Until then, beware of snakes in the wild. You’re not their usual prey, but then you really never know.